Button’s got a Brand New Bag! British F1 Driver, Jenson Button took his ex-Honda car to the top of the time sheets yesterday whilst testing the new Brawn GP BGP 001. The new car showed great speed earlier in the week which was proven when Jenson went over a second quicker than Ferrari man, Massa and 2.5 seconds faster than reigning World Champion, Lewis Hamilton. There is little doubt that the car was in low-fuel qualifying trim but data suggests that they were quick all day in various set-ups. Not bad for a car that first turned its wheels less than 7 days ago. 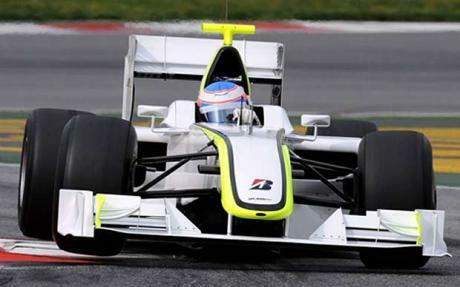 The newly formed Brawn GP rose like a Phoenix from the ashes of Honda F1 Team. Honda announced in December that they were pulling out of the sport and that the team would be sold on to the most eligible buyer. Many speculated about who would buy the team but it was just last week that it was announced that Ross Brawn (Honda Team Principle) had been successful in leading a management buyout. They also confirmed that Grand Prix veteran Rubens Barrichello would partner Button in the 2009 season. Based on this performance many people across the paddock believe Brawn are one of the teams most likely to be able to challenge for the Championship. Fernando Alonso has been quoted by the Spanish Press as saying “Ferrari, Brawn, or BMW are, right now, unreachable”. This isn’t surprising as the 2009 car started development in 2007 and improvements to the 2008 car were sacrificed in order to work on the 2009 challenger. Ross Brawn who helped Michael Schumacher to seven World Championships, has rejuvenated the team who were drifting to the back of the grid in 2007 after a great 2006 season. Lets hope they can continue this form and maybe, just maybe we might get another British World Champion.